Meghan and Lance were the perfect couple to photograph! Married only a few months and naturally lovey dovey made them perfect in front of the camera. Lance knew just how to love on his girl and Meghan… can we say gorgeous inside and out!? She was a dream to photograph in her beautiful dress from The Perfect Dress Bridal and his suit paired with a Zuzu tie was on point! Meghan’s soft, natural makeup was done by the amazing BBeautifulArtistry. We shot at Sportsman’s Paradise in Paradise, Utah. The rustic venue was surrounded by a gorgeous field, trees, mountains in the distance, and a pond. A beautiful place for a wedding reception! We had some wonderful Utah vendors contribute to this beautiful, soft fall styled shoot. First off, Kylee Ann of Kylee Ann Studios. She is such a sweetheart and put this together for several of us photographers during her Utah sleepover. Margaret, of BB Events is an incredible designer/wedding planner. She used an original table from the Bluebird Restaurant in Logan to create a romantic table-scape for the couple. My favorites were her apple candle holder and baked apple dessert. The perfect romantic, fall touch. Pace Made did all the stunning calligraphy for the menus, cards, and backdrop. The beautiful, yet simple, cake was made by Howies and Co. and surrounded by some beautiful florals. 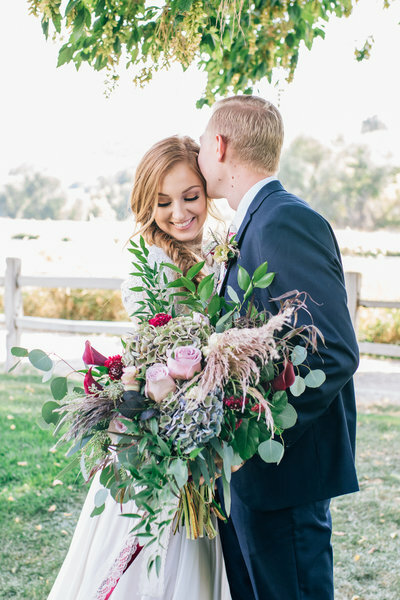 The gorgeous bouquet and floral pieces were done by Plant Peddler Floral,who when above and beyond bringing the colors and feel of the shoot together. They screamed fall romance! Lastly, Staghead Rings provided stunning rings for us to photograph. The rose gold that is so popular right now is just beautiful. A BIG thank you to all those that participated in making this such a stunning session to be a part of!